The restaurant has its own parking in front or back of the main cottage There is valet in season and for private events. Entrees are Made From Scratch and We Promise they will be Worth the Wait! Everything was great, especially the service. I recommend some bug repellant to ward off mosquitoes and other pests while eating outside. To expensive for what you receive! This was our first visit and will definitely will not be the last. Our server, Linda, was excellent. Looking forward to going back, with friends, when they have entertainment . Dave and Jeannie are the best! Great food, great atmosphere. Just the right mix of Caribbean vibe and Naples panache. Our favorite place to bring friends and just have fun. Don’t let the view from the road deceive you. They have an elegant seating area that includes both indoor and outdoor seating in the back behind the bar, plus a bar area you can sit. the food was great, the servicer was awesome. The menus is a little pricey for what you get compared to other areas in Naples but live music, outdoor seating and a phenomenal server made up for that. For our entrees we had the Caribbean Duck and the Salmon. For dessert my hubby had the homemade key-lime pie which he said was awesome. I am gluten free and most items on the menu are gluten free! This was so refreshing as I had so many options. This is a great hidden gem. Love the atmosphere! Excellent service and food was delish! A neighborhood gem. The owner is on site and passionate about the experience her guests receive. We talked books and personal geography. What a delight. The black bean soup was fantastic with firm beans and boastful flavor. The calamari salad on spinach with a dijon dressing was among the best we have had. The calamari was cooked perfectly and the wilted spinach was just right. Wine pairing suggestions were right on, and we had no trouble with our own wine and the modest corkage charge. The outside dining was delightful in a calypso setting with a Don Hon knock off on the organ. Only negative was the nats eating us at sunsetn. More citronella please. All in all one of the best bargains if you like great food, an unconventional atmospehere and friendly personal service. We will be back soon. Arrived early and had a drink at the bar. Friendly staff with laid back vibe. Ate in the outdoor dining area. Food was excellent and closer to fine dining in quality the laid back feel of the restaurant and bar would suggest—fine dining in shorts! Perfect! Service was prompt. Owner stopped by several times to check in and also helped table service time food. Great food and great service! Very interesting and appealing decor. It took over an hour for our food to come out of the kitchen. Thank goodness the music was good. Great dinner at the Real Macaw! It's not your typical Naples dining experience. Love the ambience, food is delicious and I am addicted to the Johnny Cakes! We have eaten here before and enjoyed it. Wasn't worth the return trip. Food was mediocre, service was really slow and entertainment was a bit loud. The food was not quite as good as we remembered. We were given 2 jonny cakes, but I remember a basketful from previous visits. My husband's black bean soup was barely lukewarm and the beans barely cooked. The tuna tartare was ordinary. Given the average price of an entree, the quality is not what it should be. Great food, owner really cares about her patrons! Love it our friends loved it! The food was outstanding, as usual! The ambiance along with the quiet room was great after all the other noisey restaurants we have been to here in Naples. My son went to the real macaw last week and said he had a fabulous meal, the Caribbean duck and mashed potatoes. So for my daughter’s birthday dinner I thought I would take her and my husband. I ordered the Caribbean duck but was not terribly impressed. It was tasty, the tamarind sauce added a nice sweet tang, But I felt that the duck was a little bit overdone and the mashed potatoes were a little skimpy. My daughter ordered a chicken dish with one shrimp and a little kielbasa and my husband had a vegetarian bowl. We had dessert and mine was pretty unremarkable.We were seated close to the door even though I had mentioned it was a special occasion. I said it was a birthday dinner and there was no candle or any fanfare. I guess for the price point I expected a little bit more. I think I will go back just to see if maybe this was just an off night as the people there were extremely friendly and the setting is really cool. This is one of our favorites in Naples and we love going back again and again. A hidden Gem along Bayshore Drive easily missed . Love the tropical Key West/Caribbean ambiance with the Peacock Chairs at each table. Excellent food all around, especially the seafood. Attentive service as well. We were taken there by a friend years ago, fell in Love and now introduce other friends . Our favorite tropical cocktail? The Painkiller. Only place we know that serves them. We will be back next season for sure. Waited over an hour to get our dinner and it was mediocre in taste and not even hot! I told the server it wasn’t hot and he shrugged at me and walked away. Very disappointed to have spent $160 and to have driven an hour to get there, only to have such a poor experience! I never order chicken in a restaurant because I cook at home often. Roasted chicken was delicious. Real comfort food. My husband ordered the duck and I will order duck next time. Friends ordered pork and raved. The bread pudding perfect but lost the bottom crust to key lime pie. Water and drinks good. Strange comment, but the last restaurant the water was terrible and drink tasted like water after the ice melted. I Understand it was crowded, but I wish they cleared my plate before bringing next course. I don’t give 5 out easily maybe the next time we go. It’s never good when the seafood has a rubbery feel to it and therefore of course needs to be sent back. The waiter was very good, and I was surprised the owner, who is in the building, never came over and expressed her disappointment and perhaps her apology. Very quaint. Great service! Interesting menu options. As always, The food was excellent. The service was very good. The atmosphere was excellent. We sat inside and that’s the noise from the music still allowed a conversation. We enjoy the outside but the music sometimes make a conversation almost impossible. My only recommendation would be to keep the music but turn down the volume. Loved my menu choice and coconut cloud martini was amazing!! There were 2 couples and we all tremendously enjoyed our superb dinners ! I am gluten free so i was very excited to go to a Restaurant that offered so many GF entrees ! The service was excellent and the owner seated us and explained everything to us while waiting for our server, since our first time there. We were about ten minutes early. The decor was great ! Plus outside seating but was raining that day. We will be back but it was near the end of our time on vacation ! Does not open till 5pm ! Linda was our server and was excellent . Was very attentive and answered all our questions ! Man was holding dog on lap & it proceeded to LICK the charger plate which gets put on a pile of same & silverware was stacked on top of OT!! Filthy!!!! Great food and atmosphere. Lovely outside courtyard with great entertainment! Friends in town. Cute place. Good food and music! We have a ate here before and we do enjoy the place. It is very cute and different. The food is good and reasonable. However, they had “issues” with their service that evening. They got items mixed up and they were very slow. We were with friends enjoying conversation and weren’t in a hurry so it wasn’t that big of a deal but they were struggling. I will say that they tried very hard and apologized several times. The owner even came out and tried to help. I appreciated the effort. The bigger problem was the noise. It was very noisy which made it difficult for us to have a conversation. There was a larger table of about 8 that was near us which were loud to the point of being rude. However, that isn’t necessarily the restaurant’s fault but it did make our experience less enjoyable. We would go back. Great atmosphere - love the outdoor dining. The music was a nice touch. Waitstaff and hostess were wonderful. The food was awesome! The special was jerk port tenderloin - and it was to die for....needs to be on your regular menu! Food and waitress was excellent. Skip the bar - bartender rude and disinterested. 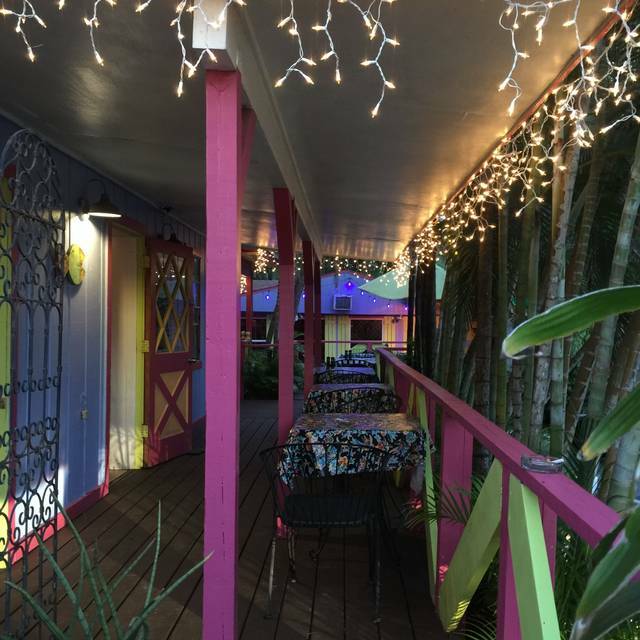 The Real Macaw has a true key west vibe with great food. The dishes have an island flair and were prepared to perfection. The owner Jeannie is amazing and her energetic personality added to fabulous fun dining experience. We will definitely be back!!! Our second time here was not as good as the first. We sat outside as the weather was nice and comfortable. There were 4 in our party; for two the food was very good and for two just so-so. The real issue was that when our food was served, we literally were swamped by flies that seemed to have appeared out of no where. We concluded that it was the food that attracted them. It was very annoying to say the least. If we go back, it will be indoor seating.